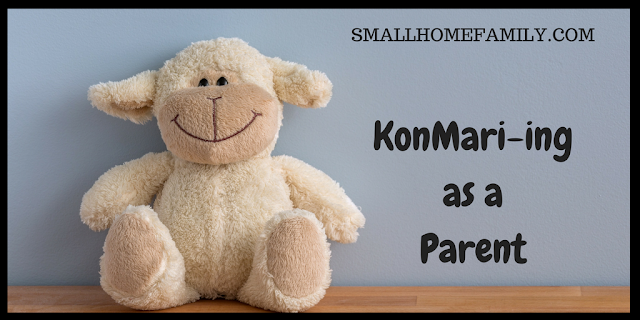 It's time for a KonMari update here at the Small Home Family blog, and today I want to talk about what it's like to go through the KonMari process as a parent. In her first book, Marie Kondo describes a journey that frankly seems almost impossible with young kids. In her second book, writing as a mother herself, Kondo gives more grace, and I think that grace is going to be necessary for most parents who choose to follow this method. It's okay if it takes longer than six months or if you need to skip around to make it happen. We've been going slightly out of order in our decluttering journey, choosing to tackle komono before we deal with paper. I just find the paper category so overwhelming and difficult to deal with when there are kids underfoot. Rather than getting off-track completely, I've decided to keep moving in the other categories and come back to paper later. Make the method work for you. Here's the truth: it's nearly impossible to work through large categories all at once when you have kids. It took me a whole afternoon of child-free time to go through my own small(ish) wardrobe, and afternoons like that are few and far between. Breaking the KonMari categories down into narrower sections has been my own key to success so far, and this is actually something Marie Kondo recommends to parents in her second book, Spark Joy. I also want to address the elephant in the room: kids have stuff. A lot of stuff. I remember before Sunshine was born, I would see all of the things parents had for their kids, and it all seemed so unnecessary to me. We would never be those parents. To some degree, that has been true, but in a lot of ways, I've had to eat my words, like when were sure we wouldn't need a crib. We bought one when Sunshine was about four months old, and even though she didn't sleep in it much until she was eighteen months old, it did make our lives easier having it. We also bought an exersaucer and a swing (out of desperation for a place to set our fussy child down for just a few minutes), and we were gifted large toys and stuffed animals and dolls. We have a play kitchen and drawers full of clothes and cloth diaper supplies in all different sizes. There are books and books and more books. Compared to a lot of our parent friends, we've kept things pretty minimal, and I would never say that we need any of this stuff, but it does make our lives easier to have many of these things (like the Stokke Flexibath). I know some parents choose to get rid of all the baby/kid stuff between children, but we just can't afford to do that, so many of our items have needed to be stored somewhere, and that obviously takes a lot of room. I have off-season and wrong-size kid's clothes and shoes stuffed in places all over the house. It's overwhelming, and I would love to just get rid of it because it certainly doesn't all spark joy in the moment, but when that day comes that the next child has suddenly outgrown all of their pants or I need an extra pair of arms to hold the fussy baby so I can make dinner, I am extremely grateful that I have those clothes and that playpen or that swing in storage. We're past some of that now since we have downsized the baby stuff, but it's still a concern that I don't see going away, especially as we start homeschooling in earnest in the next few years. Kids just have a lot of stuff. I admire the families that make life happen with much less, but that's just not us. When it does come time to downsize kids' toys in particular, it's been a joint effort, and I think my kids are little hoarders in the making because they often want to keep everything. We've gone through stuffed animals by choosing three items to keep and one to give away over and over until we've gone through everything. No, this doesn't really jive with KonMari, but it's been something that my four-year-old can grasp. Another method we used to downsize toys is to let Sunshine line everything up according to how much she loves each thing. Then we draw a line and everything on one side of the line we keep and everything on the other side of the line goes away. The honest truth is that I hate making my kids get rid of toys that they insist they love (but never want to play with), and I try to be careful not to get rid of things that I know they will miss. At the same time, though, I desperately want to teach them that life is about so much more than "things." Finding that balance has not been easy for us, and I don't have all the answers. Hardly. Living in a small space has given us a lot of opportunities to practice letting go of things, for better or worse, and I hope my kids will appreciate these lessons as they grow. When I read chapter four of The Life-Changing Magic of Tidying Up, I just had to laugh at the contrast between Marie Kondo's life and my own. In this chapter, (an at-the-time-childless) Ms. Kondo writes a lovely picture about her routine when she arrives home every day. It's calm and peaceful, and she makes it sound so easy. She takes the time to unpack her handbag, and every single item inside goes to its designated spot. About 90% of the time, I am not alone. If it's been particularly rainy, I carry my girls in from the car one at a time to try to minimize the mud and debris that gets tracked inside, but usually Sunshine walks while I carry Sweetheart and my backpack/diaper bag. Sometimes Sunshine carries her own backpack with blankets and car toys, and sometimes I do. We all squeeze through the door into the tiny entryway, where I call after Sunshine to remember to take her shoes off before she jumps on the couch. I put Sweetheart down along with whatever else I'm carrying and try to get my (usually muddy) boots off before she takes off up the stairs or runs behind the toilet. Then I take off her shoes and walk her to the gated living room where she often cries at the gate because she's a toddler, and toddlers cry a lot because...well, it could be anything, right? As I call back to her that mommy will be there soon, I rush to pick up the bags and shoes that got left by the door and quickly put them in their spots (or shove them out of the walkway depending on how many voices are crying out for me and at what level of intensity). Sunshine is usually starving because she's always starving, and I remind her that dinner (or lunch or second breakfast or elevensies or afternoon snack or bedtime snack...) is coming soon, and, no, she doesn't need to climb up on a stool to get a piece of leftover birthday/Halloween/Christmas/Easter candy right this minute. Meanwhile, Sweetheart has hopefully forgotten why she is so upset (and has stopped crying, though the latter does not necessarily follow the former), and Sunshine has given up on candy long enough for me to maybe change Sweetheart's diaper and, if I'm lucky, use the toilet myself before rushing off to assemble some kind of halfway healthy meal or snack to keep the kids from revolting. Yep, we definitely have this whole getting-home-routine down to a science, and it sure does not look anything like the homecoming Marie Kondo experiences. Those days are long past for me (or a long way off? ), so as much as I love to think about a relaxing walk through the door, it's not going to happen any time soon. Things definitely go more smoothly if I try to put things in their proper place when we get home, but I'm still not unpacking my diaper bag every time I step through the door. Ain't nobody got time for that. So does the KonMari method work for parents? In my opinion, the answer is yes, with caveats. I firmly believe that it's perfectly okay to take what works for you about this or any other self-help method and discard all the rest, and I think that's what you need to do with the KonMari method in order to be successful in the end, especially as a parent of young children. I think it's also often the families with kids that could benefit a lot from letting go of some of the clutter. It just builds up as you transition from one stage of life to another, and every person you add to your household adds to the stuff as well. Some of it is helpful and necessary (or at least desirable for maintaining sanity), but some of it is probably just some odd thing you stuffed in the back of a drawer when you didn't have time to deal with it because your baby was screaming and your toddler was climbing the furniture. Or relics from a single or childfree life that you will likely not use again for years, if ever. If clutter is overwhelming your already stressful life as a parent, I definitely think the KonMari method is worth a try. Just give yourself grace, and you'll be fine.